The National Trust for Scotland has incorporated 83 donated walking boots into its latest outdoor ad, following a social media drive to engage its Facebook and Twitter followers. 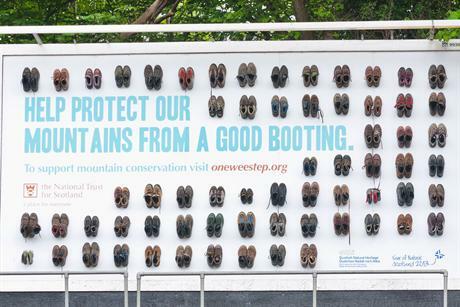 The campaign, created, planned and bought by The Union, Carat Manchester and Posterscope, promotes the ‘One Wee Step’ mountain conservation initiative. IKEA modified 6 sheet sites around Vienna by swapping their regular neon tubes with IKEA’s new range of LED lights demonstrating that IKEA can turn the ‘ordinary into the extraordinary’. psLIVE created a media first for the release of Twentieth Century Fox’s 3D animation ‘THE CROODS’ – a family animation centred around the first ever pre-historic road trip. To mark the launch, and in celebration of the Spring Solstice 2013, a giant monument was erected at Stonehenge. A Spanish charity has revealed a unique poster that only reveals an anti-abuse helpline to children…or very short adults. The Anar foundation poster can only be fully seen when looked at from a child’s vantage point due to a special lenticular printing technique. When a child sees it, they see the message ‘If somebody hurts you, phone us and we’ll help you,’ whilst an adult simply sees an image of a frightened child.